Readers might be interested in a medium-term perspective on Irish living standards. Eurostat compiles a series on GDP per person measured in PP$. The values for each country are expressed relative to the average for the EU27 or EU15. This provides a time series that can be used to gauge the trend in relative living standards before and during the recession. 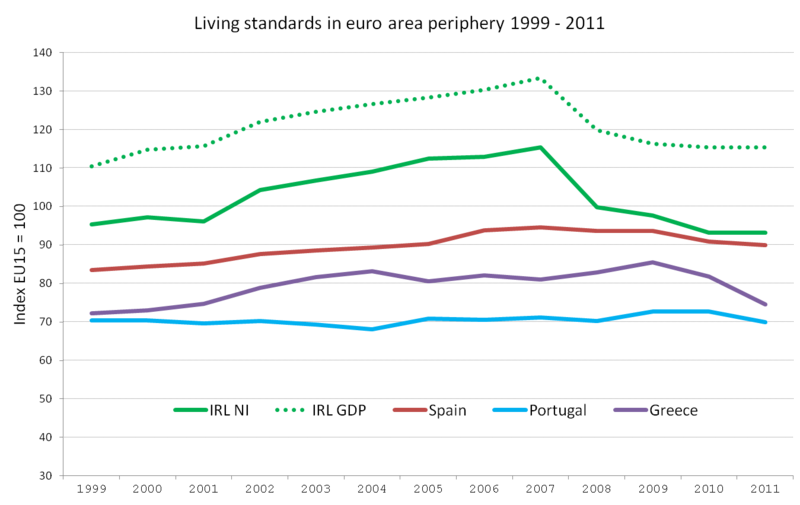 My first graph shows the values for Ireland, Spain, Portugal and Greece from 1999 to 2011. The graph shows that according to GDP Ireland started from a position about 10 per cent above the EU15 average in 1999 and zoomed ahead to enjoy livings standards over 30 per above the average by 2007. According to the more realistic measure based on national income, Ireland reached the EU15 average in 2002 and was about 15 per cent above it by 2007. The other three countries achieved some modest catch-up over these years. All four countries suffered a marked decline in living standards relative to the EU15 average after 2007. The scale of the decline is surprisingly uneven, with Ireland (on the GDP measure) suffering a 14 per cent drop from 2007 to 2011, while the drop in Portugal was only 1.6 per cent, 4.9 per cent in Spain and 8.0 per cent in Greece. If we focus on the national income measure for Ireland the drop in living standards was almost 20 per cent. This implies that we are now one fifth worse off relative to the EU15 than we were four years ago. Our standard of living has fallen below the EU15 average for the first time since 2001. The second graph compares Ireland with the UK. When the comparison is based on Irish GDP, it may be seen that we went way ahead of the UK between 1998 and 2007. After 2007 the Irish relative position deteriorated but by this measure we still remained almost 20 per cent ahead of the UK in 2011. When the comparison is based on national income the Irish performance relative to the UK is much less impressive. We drew ahead briefly between 2005 and 2008, but are now some 5 per cent behind. What do you think accounts for the much worse position of Ireland compared to Spain/Greece/Portugal? Is it related to costs here not falling in line with incomes or some other drivers? 1. why show “living standards”, an undefined term of your own (? ), or what data is that, from where, which people like me can look up ourselves ? 2. why do you show only GIPSI countries, and not the core and the Eastern/Baltic as well. Are you content with being the 3rd worst, or do you want to compare to all 17 /27? 3. Showing data from 1999 on only, and not from like 1992, is misleading, if you would compare to the center, Germany. 4. showing data only after a bubble burst, is misleading, the typical demagogue Paul Krugman style. Ihre Rechtschreibung ist tatsächlich sehr genau! I have added a link to the data. Enjoy! genauer, if you want to make an economist feel bad, telling him that he’s using methods used (and explained) by Paul Krugman won’t usually cut it. It’s a bit like telling a chess player that Kasparov used to play that silly opening. 1) The Ireland GDP/national income data for much of the period is unreal since it includes as investment what were really largely transfer payments in respect of ghost estates and other unmarketable developments. [Has anyone published reconstructed realistic numbers, official or unofficial, for GDP/national income?]. 2) It accepts GDP/national income per capita as a good proxy for relative living standards and their evolution. As Eurostat says: Although GDP per capita is an important and widely used indicator of countries’ level of economic welfare, consumption per capita may be more useful for comparing the relative welfare of consumers across various countries. Actual Individual Consumption, abbreviated as AIC, refers to all goods and services actually consumed by households. It encompasses consumer goods and services purchased directly by households, as well as services provided by non-profit institutions and the government for individual consumption (e.g., health and education services). In international comparisons, the term is usually preferred over the narrower concept of household consumption, because the latter is influenced by the extent to which non-profit institutions and general government act as service providers. If AIC/GDP per capita is taken as a measure of the sustainability of individual consumption, then in 2011, the UK (GDP 108, AIC 118) and Greece (GDP 82, AIC 94) were the outliers on the bad side. Ireland was great [due to the distorted GDP!]. National accounts aggregates can be heavily distorted by the accounting treatment of industries which do not complete sales within a short time-span. GDP is a value-added concept and includes corporate profits. If these are imaginary, as was clearly the case with Irish bank profits, GDP is overstated. But the same problem arises with the construction industry, whose ‘output’ is valued by producers in advance of final sale and settlement. Had the construction industry been producing unsaleable ice-cream instead of unsaleable houses, the Irish GDP figures from about 2003 onwards would have been far lower (that is, had construction output had been valued at the prices which eventually materialised). The figures would have been lower again if the ‘output’ of the banking industry had been adjusted with realistic provisioning. While it would be absurd to expect that national accounts statisticians could have foreseen the write-downs which eventually emerged, and while it is right to acknowledge that standard methodologies were followed, it would be an interesting and salutary exercise to re-state the Irish national accounts for the last decade using realisable measures for the output of the banking and construction industries. Our standard of living has fallen below the EU15 average. Yet our consumer prices are still 17% above the EU27 average. “We are now some 5% behind the UK” – yet many consumer prices here (not all) are still way ahead of the UK. People would be more willing to accept lower wages and welfare if consumer prices fell. By that I mean outright deflation in some sectors, e.g. retail pharma prices, telecoms, energy. I think it is now widely accepted that even the US data was polluted by ‘production’ from the financial services industry, so we should expect these series to be significantly distorted. The contrast between Irish and Spanish data is curious though. It will likely take years and years of sacrifice of the vulnerable as the economy gets more and more distorted with sticking-out-like-a-sore-thumb style high wages, inefficiencies and high costs in the protected sectors – followed eventually by default, the materialisation of Michael Noonan’s space programme, or the rest of the population making it clear they won’t accept the fixing at their cost any longer. The short-cut (possibly a decade quicker) it the introduction of a parallel local currency. You could remain basically Euroised, but have refuseniks’ contracts paid in ‘Ieros’ or ‘Crokies’ or something. The recent constitutional amendment excusing “any act required to meet an obligation of the Treaty” makes this far easier than it would otherwise have been. Sorry, I was a little rash, because the starting point 1999, which was the winter of our discontent, always distorts the picture, especially in Germany, and since we are 27% of the Euro, to a certain degree in the whole area. Especially income distributions, development of wages, unit labor costs. I believe that the interpretation from “PR Guy”: “much worse position of Ireland “, would be mostly gone, after plotting from a substantially earlier starting point. 1995 -> 2011: Germany 129 -> 120, despite some eastern Germany catch up to be expected, Ireland 103 -> 127, in your eurostat link. These were not Bernanke helicopters, but with 100 % GDP, deutschmark carpet bombing. Immediate, 100 % control, “copy exactly”, and productivity is still on a level like Spain. These GDP figures have become substantially misleading, every year there are 2 or more proposals for a “better index”, HDI is one of the better ones, most you can finish off after half an hour, but the AIC from Antoin looks actually more interesting than all I have seen in the last few years. Yeah, Krugman has a Nobel price, but Hayek too, and I would be interested to find an admirer of him here. And he plays so wonderfully to the “physics envy” of so many economists. As a physics PhD I also liked that initially. Point is, economy is not like physics, your micro mechanics do not follow exact and stable laws, and your macro is practically always a mixture of several effects. Therefore, deriving grand sweeping conclusions from extremely simplified equations, the classical Krugman style, is delusional garbage. Tell me one paper from Krugman, you admire, and just 2 or 3 sentences, why. And let us see what I will say about it. I agree with seafoid, that you mostly observe a price bubble fueled by cheap credit, only partially caused by the introduction of the Euro, and to a very significant degree by the Greenspan policy. Many of us envied Japan around 1990, this seemingly unstoppable production power, in the new industries, like semiconductors, growing so much faster than we could. It was the same thing, a price bubble (Tokyo more worth the whole United States at some point, fueled by very low interest rates, high debt, originally only by the corporations, enabling leverage, then the consumers, http://de.slideshare.net/genauer/consumer-debt-9349151 . Keep in mind that Japan, like Germany, has a lot lower home ownership, mortgage part of that household debt. And now the Japanese government to a gross degree as well, and on a completely unsustainable deficit path, following Krugman’s recommendations. When you look at the fundamentals, most things in Japan require effort, agriculture, exchange of materials and parts with neighbor countries. This shows up in the long run, sitting in the center of Europe, not too overpopulated, sometimes has some advantages. Good point, do you have a “Aldi” or “Lidl” in your neighborhood? Otherwise other discounters have to make do. I did a comparison between Germany and the US in 2003, 2010, and this summer in Northern Italy, where the same standard products (even same provider) were at least 20 % more expensive. The comparison of a list of about 20 items would not take more than 10 minutes to write down the prices and another 10 minutes for putting them into existing spreadsheet. Interested? A detailed comparison, I made for my own decisions, gave me, that I need some 1.9 – 2.2x Dollars in California, relative to 1.0x Euros here. I would be interested to get some similar Irish data. – … things in Japan require “more” effort. This “required bigger efforts” show up in the long run “in a little lower PPP GDP”. Perhaps the word you are looking for is ‘gouge’? It’s a particularly Irish one and often used as a technical term related to the high prices one finds in our beautiful country. As the saying goes, it takes two to tango. The euro crisis has many parents, Germany included. As regards comparative statitsics on living standards, these leave me cold. There is a term in the computer world, if I am not mistaken, GIGO = garbage in equals garbage out. The input of statistics, as CMc points out above, is so poor that the output is equally bad. By the way, there is a Lidl AND an Aldi in practically ever town in Ireland and they have done wonders for both competition and the accumulation of broken gadgets manufactured in China in every garage in Ireland, my own included. Off topic but related, nevertheless, to the essential European treaty objective of balanced growth and prosperity throughout the European Union AKA living standards. Also off topic but a useful guide to the blogs to be consulted (apart from this one, of course). When I criticize here certain statistics, and how some folks plot them, as imperfect, I am driven to make it better, together, to get to agreement. And NOT by some frequent attempts, especially from the far right and left, that everybody makes up his own phantasy numbers, to fit the respective agendas. Here around there are plenty of lunatic folks, who do not hesitate to invent stories, like the former eastern GDR being rich, and the nearly bankrupt western Germany being saved by tricking the easterners to joining in 1990. Just 10 days ago, it leaves me nearly speechless. When I look at this EU commissioner Andor, in your FAZ.net link, I see exactly what I hate about the EU. Some unelected idiot, studied at “Karl Marx University”, aaaaargh, socialist, spewing the traditional socialist nonsense. Wages not set by the employer and employees, represented by their union, after hard strikes, if necessary, but by some alien criminal communist commissar, like him. What do you like about him, to cite him approvingly? I see him as one more reason to complete abolish the whole EU commission as manifest evil. Which commissioner do you want to defend? I do not know a single one, I consider good. My interest is still here, that somebody here spends some 10 minutes and goes into an Irish version of them, and takes down some prices, to compare “exactly”. PLEASE. Profits of US MNCs in Ireland doubled in the period 1999-2002 and continued to rise despite a marginal change in activity. So excluding the property sector and discounting for fake output elsewhere, was there any real growth in the years leading to the crash? Rossa White, when at Davy, calculated that private sector net investment in the capital stock – apart from retail, storage, transportation and housebuilding – was only €14.5bn in the eight years to 2008 (in constant 2007 prices). That equates to an increase in the volume of the capital stock of 26%. The claim by Bank of Ireland that Ireland was the second wealthiest nation on earth struck me as a dodgy proposition and the No. 1 was as dodgy. In late July 2007, days before I bailed-out and more than a week to the start of the credit crunch, I wrote: “For those who would in this grim summer of rain, cast a jaundiced eye on the glad tidings of an increase of 10% in the number of Irish millionaires (excluding principal private residence), consider the lot of the wealthiest nation – Japan. Earnings fell the most in more than two years, according to a recent report.Wages fell 1.4% in January, the biggest fall since June 2004, the Labour Ministry said. A recent Japanese Cabinet Office survey showed that people felt a high level of anxiety about their daily lives, the highest angst level recorded since the poll began nearly 40 years ago despite a recovery in the economy…Japanese companies have kept wages in check in part by shifting more work to part-time employees, who now constitute over 33% of Japan’s workforce, up from 20% in 1992. The corporate sector has had the longest run of quarterly profit increases in 36 years, according to the Ministry of Finance. Earnings from operations rose over 12% in the financial year ending March 31, 2007. However, companies have not paid much heed to the pleas of Prime Minister Shinzo Abe to pass on more of their profits in wages. Instead, they are investing in new factories and upgrading equipment after a decade-long economic stagnation that followed the bursting of the bubble economy of the late 1980s. Toyota raised its wages last March by a monthly average of €6. Japan posted the lowest car sales in the twelve months to March 2007, since 1977. With a decade of wealth accumulation behind it, the Irish economy’s total wealth per head places the country second amongst 8 leading OECD countries, behind Japan and ahead of both the UK and the US. Total wealth per head in Ireland stood at €148,130 at the end of 2005. Emerging market-like income growth, American-style spending and Germanic savings habits underpin a continued growth in the stock of wealth over the coming decade. The Irish household balance sheet is in a very strong position, with gross assets close to €800 billion at the end of 2005. The asset side of the balance sheet includes both financial and nonfinancial assets. The dominant asset, unsurprisingly, is residential property. Household debt stood at €115 billion at the end of 2005, or 140% of personal disposable income. At €681 billion, net assets as a percentage of personal disposable income stood at just under 830% – a healthy ratio by any standards. The report estimated that the number of millionaires in Ireland was somewhere in the region of 30,000. Folks, I don’t presume to speak for Brendan Walsh, but I think some of you are failing to see the most striking fact about his graph. 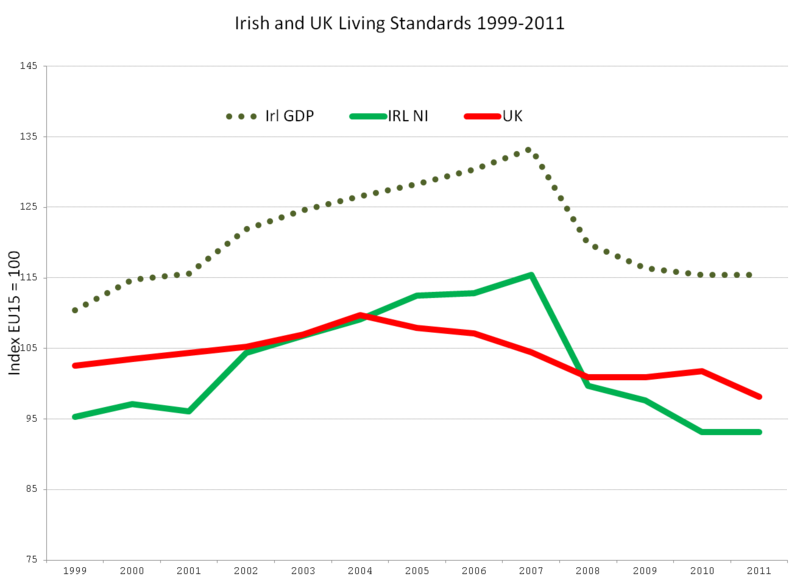 Comparing 1999 with 2011, that solid green line is pretty much back where it started. We’ve wasted more than a decade already. The P/E ratio (I hope I don’t have to explain that here) for the Nikkei was still around 40 in 2007, there was simply no room for any substantial pay raises, despite the “longest rise” of the tiny (fake) corporate profits. I assume, you see that as a stern warning against glowing wealth reports, based on bubble prices. So the tiger was actually an aisling. According Brendan Walsh it was a hare. It’s pretty galling to look at that paper now in the light of what came after. I think we’re all missing the point here. Ireland’s current living standards are incomparable to those of the 19th or 20th century. We are doing really well. Europe’s living standard is way better now than it was. Since the second world war the western world has been doing something right. It has raised millions up from poverty. That is wonderful. So what characterises a functioning system. What made Europe (and the west) work (for the most part) between 1950 and 2008? And why has it stopped working now? 1: Small autonomous countries protected in their political sovereignty. (Please compare Hungary to Romania and Slovakia in the Eurostat link above), before him 1999 –> 2003 relative 54 -> 63% of EU-27, and then until 2010 absolutely no increase over 63 anymore. Therefore his Socialist party was massacred, and the opposition Fidesz won a more than 2/3 landslide, enabling constitutional changes. I have never seen anything like this ever, on a national level, in any western country. Anyone of you? Tell me! And now this total failure guy Andor goes around, and wants to tell others, how to screw up their country too. And, not to forget, always blame the Germans. Why did Romania then go from 31 -> 49, and Slovakia from 55 behind to 73, over the same period? Soo, it is now much more possible to blame the Rest of Europe, specifically Germany, on their own errors and failures, and that will further and further increase the centrifugal, nationalist forces. Given our extremely different history and geography, compared to the Canadian Federation, I do not see that Eureka’s option A is available. That leaves option B, those who do not like the Maastricht treaty, and believe they are better of outside the Euro, were better of before it, should leave. Maybe more of the Baltics, Scandinavians, Poland, Czech, come then in. Germany is guilty of nothing more than protecting her interests. Germany is not to blame. History has shaped all our outlooks. Europe has always struggled with sovereignty. How big should a union be? How should it come about? There must be something to pull it together – some unifying ideal. Fear of a common enemy isn’t enough. There must be something else. What keeps Germany united? A very significant intervention by Steinbrueck, a possible SPD candidate for Chancellor. Google Translate does a pretty good job of it. Time to dust off the analysis of Adelbert Winkler to which I have drawn attention on a number of occasions! “Breaking the links between sovereigns and banks” by setting up a fund financed by sovereigns is a contradiction in terms. I am trying to get back here to Brendans “trend in living standards”. To measure this somewhat better in the future than GDP numbers is one thing, we need to work on. The more important thing, from my perspective, is, how do we raise it, individually and together. For me, creating property price bubbles is not it. In fact low prices are good for young and “poor” people. Cutting benefits back to sustainable levels has only beneficial effects, if that brings more people back into profitable work. Continuing to built too many houses, people can not afford, is not that. Destroying the trust of people in a stable environment, prices, neither. But whom am I to tell Spaniards, Romanians, etc., what they could be good at, what they should do? It were the socialists Lafontaine and Dr. “class war” Heiner Flassbeck, who tried to force German marginal tax rates of 60% onto other European nations, via “rapid tax convergence”. I have become deeply skeptical what “development aid” can achieve, and I see Greece as an example of the perverting effects of too much financial “help”. I did buy into this Goldman-Sachs BRIC story (capital driven), it was profitable, so no complaints from me about that, which was based on Solows Growth model, which I now see as deeply flawed. Hey, anybody interested to discuss his 195x papers, in detail? I now think that these “soft”, “endogenous” factors, how do you built a smooth, just society, as way more important to raise internal productivity, robustly. And this is something, Scandinavians and Center Europe (Germany, Dutch, Austrians, … France) can show something. 1. “How big should it be” is the wrong question. We all know these scaling laws, larger is better, twice as large often accounting for some 10 – 20 % lower cost, but corporations also didn’t grow infinitely, resulting in one big state monopol in the end, or just one big capital dominating a large country. This was a lot more complicated process, than most of you probably know. In principle the Habsburgian (Austrians) were “German Emperors” of the “Holy Roman Empire of the German Nation” until “Reichsdeputationshauptschluss” 962 – 1803, there was a Germany, but in name only, like Chinese and Japanese emperors were that in name only. And, in principle, 1806 – 1871 was just a short “interregnum” before the “second Reich”, cough. I think it was the repeated outside intrusions, especially Napoleon, which united Germany, and Bavaria and Saxony kept their kings, nominally independent armies until around 1918. There was some attempt of “Verfassungspatriotismus”, rally the nation around a constitution, which is still not called that. I liked that at that time, but I see this pretty much as a theoretical head fake by now. In summary, it was the French threat, and the growing national antagonism in the multinational Habsburg empire, which shaped the Germany as it is today, without Austria, not some glorious cultural “fatherland” feelings. then he has quite a bit of reading up to do. What Steinbrueck is saying is that banking is a cooperative business – who can deny this? – and that banks should cooperatively finance the necessary insurance arrangements to stay out of trouble, with creditors and shareholders taking the hit if they do not. Who could object to this? Certainly, not many in the “burn the bondholder” brigade. I do not think that what he proposes is very likely. Sovereigns and banks are stuck with one another whether they like it or not. However, it does not augur well for any rapid participation by the ESM in bank recapitalisation. Note also what he says about a return, effectively, to Glass-Steagall as far as European banks are concerned. Again, who could possibly object to this? Husbanding your depositors money and speculating with it are irreconcilable activities. Regular supersonic low altitude flights above our heads. Every first grader knew the difference between the signals for fire alarm, nuclear and other attacks. I doubt this was the case in your childhoods. b)	The second fear was France and Germany going at each other, again. The only justification I find for these regular French/german mini summits, to the present days, before the whole of Europe meets, when then , most the times the prepared proposals were just nodded of. As a non French/German I would hate that, a lot, and this can not go on much longer. We had some celebrations here today of “50 years French/ German friendship”. Everybody being nice to each other, but often it looked more like gnashing teeth. Enthusiasm looks differently, more like the pictures 50 years ago. And with the 2 iron clamps (anti CCCP, close French/German) gone, for good, I don’t see any pan European enthusiasm any more, in most other European countries even less than here, but lots of centrifugal forces. Soo, we will do, what we have always done, do our own thing. Maybe we can learn from Czech and Slovakia, how a clean and sober divorce is done, between “civilized European people”. If we ever were that. your translation “creditors first” is not correct. But in general Steinbrück is just playing to a German public, for which “Gläubiger und Aktionäre” are just the same rich ilk, which has nothing to do with them. That all these 14 million “Riester Rentner”, low/middle class, are in fact “Gläubiger”, they are not aware of, so far. He is still dreaming of becoming German Chancellor. For those of you, who can read German, read Steinbrücks book “unterm strich” and Tilo Sarrazin “Europa braucht den Euro nicht”. the First just refernces to german broadsheets, the second numbers, models and repeated FT and other non-german references. A class apart. The view from down under. Your roots are showing. Lyndon LaRouche? really? What best…stormfront? As you seem to believe that direct quotations depend for their accuracy on the medium reporting them, maybe this Bloomberg source will meet with your exacting requirements. In fairness now, Lyndon is as credible a source as the beano. What do the reported quotations have to with the credibility – or lack of it – of Lyndon, a source picked at random from the wide number reporting the remarks in question? Will I link to the NYT? Thanks for the very interesting analysis. It’s very interesting that Germany defined itself by fighting against a common enemy. It may have been what left them so open to the toxic diatribe of the 30’s and what followed. It highlights the danger of basing a national identity on fear of an enemy. I think the common language thing is probably very important along with some basic common ideals. The other thing is that the union works – it brings about (or at least coincides with) rising living standards. So now, let us look at what holds Europe together now? The European Union is not held together by much. By mishandling the Euro crisis the union has become a lot weaker. People will put up with anything that feeds them and allows them some hope – Europe is failing at this. Living standards can drop and drop before people act – the critical point in measuring them should be – how close are people to going hungry? Here’s you answer. Its magical! Enjoy! Yeah that would be better. I did not say “Germany defined itself by fighting against a common enemy”. There was a clear sense of being a Nation, especially after Martin Luther’s German bible, and we even were that since 962 as the formal structure http://en.wikipedia.org/wiki/Holy_Roman_Empire. But the folks at that time apparently were quite OK with the various kingdoms Prussia, Bavaria, Saxony, Austria and all the smaller fiefdoms. The urge to really unite, beyond a customs union (Zollverein), with a common currency and army, became only clear, after France did repeatedly chip away on German territories and imprinted their rule over how Germany is organized internally (please see the link above). The common German currency “Mark” only came 1873, 2 years after the new unification. There were serious thoughts after 1918 to break up again, but the Versailles treaty was one hell of a motivation to stay united and strike back. When you read John Maynard Keynes 1919 “The economic consequences of Peace” (get it easily, freely from “Project Gutenberg”), it is very clear that this was and was meant as an http://de.wikipedia.org/wiki/Karthagischer_Friede, (interesting, another wiki without English translation). As permanent exploitation and readily available pretext for the next invasion. When I read this first, about 2 years ago, I understood very clearly, why many Germans in the 30ties were just itching for the next war with France. And I think most European politicians after WWII understood very clearly the need for “French/German unity” in Europe, with teeth gnashed only behind doors. If possible, I see it as useful, to relax the “no 3 links” rule, to avoid “in moderation” for wiki links. It would often make sure, that discussion refers to some “common ground” text as an anchor. My understanding is, that serious riots usually only happen, when the consumption drops by more than 20 %, in places where people still have enough calories and some way for public expression, not like North Korea. There were a couple of papers, last year, coinciding with the London Riots. I have to look them up. @ genauer: I sincerely hope that we never go the ‘riot’ route. But what you have to watch out for is ‘pilfering’ of foodstuffs. This is low-tech and may or may not show up in any stats. What I expect to happen is that there will be a gradual surge in home-grown foodstuffs and the use of allotments. This change will show up when you start to see TV shows promoting Grow-Your-Own. We have some way to go yet. What I found profundly interesting about the Slinkey was its transition from a highly ordered mathematically perfect system whose behaviour could be exactly modelled, into an utterly chaotic system. I thought of Labour Markets. I’m sure there are other examples. Didn’t modern Germany come into place essentially via Prussian militarism? It’s quite a long time from Nap to the 1860s when Bismark began the aggrandisement of the Hohenzollern fief. German had a common language when it was a collection of bishoprics, margavataes, palatine jurisdictions, kingdoms, principalities and free states. It was formed in modern times by the sword. It tried ruling by the sword. But eventually we all lean the pen (on the loan document) is mightier than the sword. That falling slinky shot has to be a fake. The bottom of the slinky doesn’t move at all until the rest of it reaches it. Gravity doesn’t work like that!! An even slower-motion would show it did move! The ugly beauty of the event is the differential acceleration (change, if you wish) between the upper extremity, the centre of mass and the lower extremity. They ALL move – but at very different rates! Its completely counter-intuitive. The time-frame is 300 millisecond – Physicists love this! What bothers me is the subtle torque of the lower extremity and the chaotic event as the upper extremity accelerates past the lower. When virtual modelling meets natural reality! It makes our pseudo-econs and their maths modes look like complete plonkers! It’s amazing what can become fascinating. Either it is fascinating or I need to get out more. It seems from what the guy is saying that there are two forces at work – gravity which wants to drag every bit of that slinky down pretty much indiscriminately and then the spring recoil thing that wants the ends of the slinky to come together. It’s actually a bit like the EU – once the force that wants to bring everything together is overcome – the fall down is pretty rapid. And a bit like the EU in the beginning it actually seems like the whole thing is coming together and will not fall but ultimately it does collapse. The hand that holds the thing up in the first place is.. maybe…. a functioning trade system and economic system….when it’s gone – that slinky is going to fall. @ Eureka: “Now your getting it! Yes, the two ‘forces’ are acting in the same direction. This results in the differential accelerations of the two extremeties. The acceleration of the upper extremity is such that it ‘carries’ beyond both the centre of mass and the lower extremity (for a millisec or so) which is sufficient to initiate the chaotic event. That brief torque of the lower extremity is very ominous. It spells trouble for the system since it is due to a force within the coil itself. If it were a ‘rigid’ coil it would drop non-chaotically – as per the math! As I have been wittering on about – our economies cannot be modelled using complex math models. They’re slinkies! Nature rules! Disintegrating economically (separate currencies do not necessarily have to trigger that), or endless internal fights can reduce it a lot faster. At least for Germany I do not see that a common currency has brought benefits, and, from my perspective, several other countries would now benefit from more economic wiggle room with a national currency. I think we actually have a new lingua franca, English. France and Spain might not like that that much, so far, Germany has not a big problem with that. Most people now are taking all this for granted. I think we should become more aware of this, which makes us Europeans, historically unique (The old Question: what was so special about Europe, the last 500 years?) We could /should find more common pride in this. I think we all hope, that we don’t get any serious “common enemy” again. Germans are extremely careful of not getting drawn into foreign (military) adventures. In the moment, it became clear, that the US, UK, FR intervention in Libya went beyond the UN mandate, the German warships in the Med were turning away. We are strict with that. But, as in the case of Greece, folks fall far short of agreements, again and again and again, because they never intended to stick to their part, and tell you that openly into your face, people here get mad. This then is not just some broken arm, which heals imperfectly, but more like gangrene, or a diabetic foot, more common here around, where you have to cut at some point. I hate this short term “there is no alternative” more and more. Naomi Klein “Shock Doctrine”. We have to think more, where do we want to go / be in the long run and then find the short term ways. Breaking up the Euro would not trigger some Armageddon. Life did also go on after WWII. I am a physicist, and I am not fascinated. Maybe I am getting old …. economics will never become like physics. It consists of all kinds of actors, large and small, interacting, reflecting, “path dependent”, nearly always a mixture of several effects, and not, as it usual the case in physics. In physics, it is usually one strong simple effect dominating most situations, like in astronomy, where it is usually sufficient to just know the mass and the distance of some body, and can forget about the internal workings of a hyper complex thing like the sun. There is more than gravity, but the other correction terms show up only with some 1e-6 (one in one million) relative effect. Malheureusement, je ne suis pas un scientifique! One of the most problematic areas of physics (for learners) is the completely non-intuitive nature of some areas of Newtonian motion. Some physicists never get their head around the concepts. By the same token they never trash an economy either! The analogy with economics that has me holding my sides. However, what I do not find amusing is the deathly silence from the pseudo-econ brigade. Are these guys really that dumb? The less they comment and the longer their silence, then I guess so. The measures presented are all relative to the EU15 average. Colm: Can you be sure that the Greek and Spanish data were less beset with statistical shortcomings than the Irish? Antoin: It is true that in Ireland as in the other countries consumption fell less than national income or GDP. What does this imply for future living standards? By the mid-1970s the work of experimentalists at these laboratories, and of theorists using the data that were gathered, had led us to a comprehensive and now well-verified theory of particles and forces, called the Standard Model. In this theory, there are several kinds of elementary particles. There are strongly interacting quarks, which make up the protons and neutrons inside atomic nuclei as well as most of the new particles discovered in the 1950s and 1960s. There are more weakly interacting particles called leptons, of which the prototype is the electron. There are also “force carrier” particles that move between quarks and leptons to produce various forces. These include (1) photons, the particles of light responsible for electromagnetic forces; (2) closely related particles called W and Z bosons that are responsible for the weak nuclear forces that allow quarks or leptons of one species to change into a different species—for instance, allowing negatively charged “down quarks” to turn into positively charged “up quarks” when carbon-14 decays into nitrogen-14 (it is this gradual decay that enables carbon dating); and (3) massless gluons that produce the strong nuclear forces that hold quarks together inside protons and neutrons. Next Next post: Benchmarking III: Revenge of the Productivity Myth.